Think full, voluptuous lips and smooth, youthful skin are just for movie stars and models? Think again. Juvederm treatments, and wrinkle treatment with other popular cosmetic fillers such as Radiesse, Voluma, Belotera and Volbella are some of the easiest and most immediate ways to eliminate unwelcome wrinkles, such as “smoker’s lines” and smile lines around the mouth. These same therapies can also fill in acne scars, better define lip borders and restore volume to lips that have thinned with age. Collagen and hyaluronic acid are natural components of the support structure of your skin. Gradually, due to age, lifestyle, sun exposure, or simple genetics, these natural components thin, leading to wrinkles in your face and volume loss in your lips. Using a tiny needle, wrinkle fillers are injected just below the surface of the skin, replenishing the naturally occurring substances that give structure and volume to your skin. Immediately, wrinkles are smoothed, lip borders become redefined and lips look softer and fuller. And recovery is quick; you can usually return to work or other activities the same day. Over time, your body will absorb these substances and your skin will eventually return to its natural state. Although people absorb these fillers at different rates, you can expect Juvederm to last for 9-12 months and Radiesse to last for up to a year or more. Touch up treatments will help maintain your results on a permanent basis. 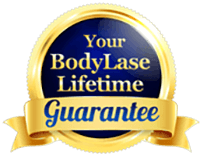 To learn how these FDA-approved therapies can help you recover your youthful skin, visit BodyLase® for a consultation.